This necklace is the first finished piece I made in my Cubed Cubes series. 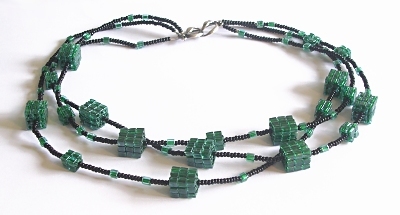 It features the original Cubed Cube beads that I made, strung and turned into a 3-strand necklace. Some of the individual beaded beads are a lot worse for wear now as they have been handled so often and it took a while until I perfected making them. Over the course of making the cubes for the necklace I refined the technique to ensure the cubes could be beaded as quickly, neatly and securely as possible. This meant adapting the original technique so that I only had one thread end to finish and because the cubes are on such a small scale I had to work out a technique to ensure that end was finished securely. Once I had worked out the technique, I wanted to come up with as many different examples of how to use them as possible. All of these can be found by clicking on the other items in the series. When I began wearing the necklace it garnered a lot of attention and many teaching requests. It was this that spurred me on to teach, and Cubed Cubes was the first class I ran and taught in December 2004.